When your special event demands something more special than everyday streamers, the party décor sets from The Flair Exchange add just the right touch of sophistication. Distinctive streamers, confetti and balloons come in easy-to-assemble kits, letting you perform a little DIY magic for birthdays, showers or any other soiree that demands a little flair. The Flair Exchange makes all products from scratch in their Maitland, FL studio, using locally sourced materials and American-made tissue paper and balloons. Owner and Creative Director Carmen Taylor Rogge wanted decorations that were more tasteful and memorable than the typical ones sold in stores. She started crafting her own designs right here in the U.S., often gathering with girlfriends over a glass of wine to get her creations done. With Carmen’s talent for pulling together eye-catching embellishments, her after-hours hobby quickly became her full-time passion. Let The Flair Exchange give your next gathering a bit of handmade elegance. When the party’s over, hold on to these adornments for your next event because they’re reusable, too. Made in the USA, multiple-use and minimal effort, this Grommet gives you plenty of reasons to celebrate. Hi! 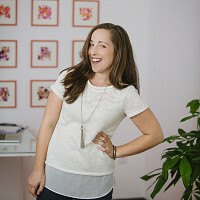 I'm Carmen, the owner and creative director for The Flair Exchange. 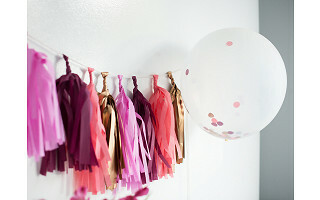 We're so excited to have our party décor featured on The Grommet today! The Flair Exchange supplies hip, eco friendly décor for celebratory occasions. Our products have, and always will be, about style and ease. Our customers know they can count on us in a pinch and don't need to be expert crafters to put together the perfect soiree. Please feel free to ask any questions, I'm happy to help. 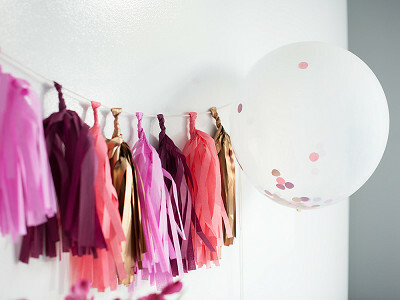 LOVE these garlands and balloons! 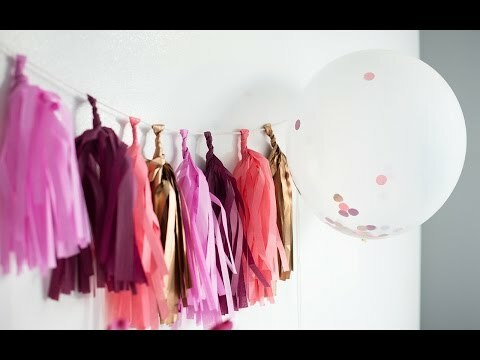 What a great and easy way to add color and flair to your party! And I love that they use locally sourced materials made in the USA! Dying over the Sugar Plum garland set! I tested these kits here at The Grommet and have been looking forward to when we share them with you all. I have several of these garlands now and love them! At first I thought, "Oh I can just make this myself" because I am pretty darn crafty. But, let me tell you, I tried and failed miserably. They never turned out like I wanted and took forever. Plus, the quality was awful. The kits Carmen makes are gorgeous and are really great quality. I have quite the collection now and reuse them often (pull them out for birthdays, holidays, etc). I just store them on a hanger and the tissue doesn't get wrinkled up. I'm spying the tuxedo one...thinking that would make great NYE decor! I'm a huge fan of The Flair Exchange and Carmen's products! I've used the garlands on several occasions and can't wait to use them for a fun project next month. The quality is amazing! If you're planning a party these tassels and/or confetti balloons are a must-have item! They are all the rage with party planners because they add so much bang for your buck when decorating. They work equally well in childrens parties or adult celebrations. Bonus - you can hang the tassels in a bedroom too, for a whimsical decorative touch. @Chris Great idea Chris to use a bedroom decor. I have one strung up in my office and love it! These are so fun! Do you offer custom colors? @Melissa Yes! We're always adding colors as the seasons change, too. @Diane The confetti balloons are only available in latex and yes, you'll fill them with helium if you'd like for them to float. Alternatively you can just inflate them with air and lay them on candy buffets or dance floors. Cheers! Can you customize the color scheme of confetti inside the balloons? Thanks. Hi Aaron, thank you for the comment. We'll put you in touch with Carmen directly. Stay tuned. When your special event demands something more special than everyday streamers, the party décor sets from The Flair Exchange add just the right touch of sophistication. Distinctive streamers, confetti and balloons come in easy-to-assemble kits, letting you perform a little DIY magic for birthdays, showers or any other soiree that demands a little flair. The Flair Exchange makes all products from scratch in their Maitland, FL studio, using locally sourced materials and American-made tissue paper and balloons. Owner and Creative Director Carmen Taylor Rogge wanted decorations that were more tasteful and memorable than the typical ones sold in stores. She started crafting her own designs right here in the U.S., often gathering with girlfriends over a glass of wine to get her creations done. With Carmen’s talent for pulling together eye-catching embellishments, her after-hours hobby quickly became her full-time passion.